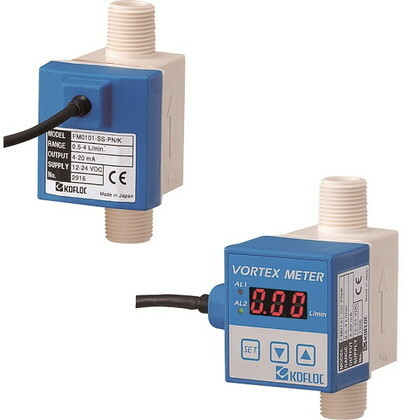 KOFLOC's Karman Vortex Flow Meter FM Series provides an ideal tool for measuring and monitoring liquid flows, in-cluding cooling water and cleaning water. Since PPS resin is used for body material, all models of the series offer su-perior reliability and durability. ・Use of PPS resin has achieved a small, lightweight and rigid. ・The sensor can be used for pure water or deionyzed water and chemicals (the sensor is acid-/alkali-resistant). ・These models are in the process of application for CE Marking.